SAN ANTONIO – Two altos from the same congregation of the church of Christ made All-State this year. 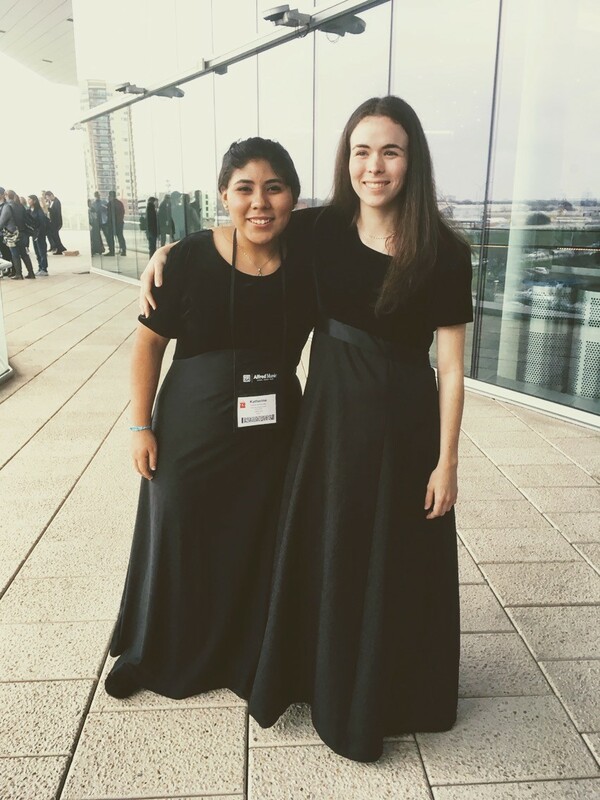 Macy Drew, 18, and Kitty Ramirez, 16, from the West Bexar County Church of Christ here were named to the 2019 Texas Music Educators Association (TMEA) All-State Treble Choir. They performed at the convention center here in the Stars at Night Ballroom on Feb. 16. The church of Christ is well known for its acapella singing. According to TMEA website, more than 70,000 students across the state auditioned for All-State choir, but only 870 were selected. Given the small percentage of those who make it, to have two selected from the same congregation is rare. Drew, a senior, attends Health Careers High School and this is her second year doing TMEA All-State. Ramirez is home schooled. She celebrated this, her first year at All-State, as a freshman. “I am so proud of their accomplishments and I know they are honoring God because they recognize Him as the source of their talent,” said Phil Hamblett, an elder from WBCCOC. There were several rounds of the competition. “The last two rounds involved sight reading and I was able to pull from being a member of the church and having to read music from a young age to do it,” said Drew. During one session, a director from a regional clinic asked students why they sang in the choir. When it was her turn, Drew, without skipping a beat, replied: “To glorify God.” The room went quiet, but that aim continues to bring blessings. Drew’s abilities as an alto gained her two music scholarships, one from San Antonio Youth Chorale and another one from Abilene Christian University. Having made the All-State choir as a freshman, Ramirez hopes to make it during all of her remaining high school years, too. All-State is the highest individual honor that a student can receive in public school music education. The Adams Street members invite all to come prepared to receive the bread of life to strengthen them as they go from day to day. Groda will speak on restoration as it applies to one’s spirit, relationship with the Father, evangelism, the brethren, and holiness. 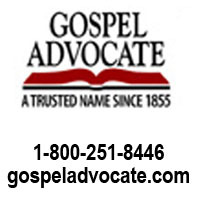 The gospel meeting begins on Friday with a lesson at 7 p.m. and the next one on Saturday, again at 7 p.m. Light refreshments will be served. Groda will also speak at the Sunday assemblies starting at 9:30 a.m. The last session that day begins at 3 p.m. The church will provide lunch. The “Worldviews at War” youth lectures go from 9 a.m. to 3:30 p.m. on Saturday only. Lunch will be provided. The lessons are based on I Peter 3:15: “But sanctify Christ as Lord in your hearts, always being ready to make a defense to everyone who asks you to give an account for the hope that is in you, yet with gentleness and reverence” (NAS). The sessions will be led by five different motivating ministers. Groda is a Beeville native who heard the gospel through the Adams Street youth group. The Lord added him to the church after a series of Bible studies in March of 1992. He graduated in 1999 from the Southwest School of Bible Studies in Austin, and then preached at Sedalia, Mo., and returned to Texas to serve with the church at DeLeon and San Angelo. 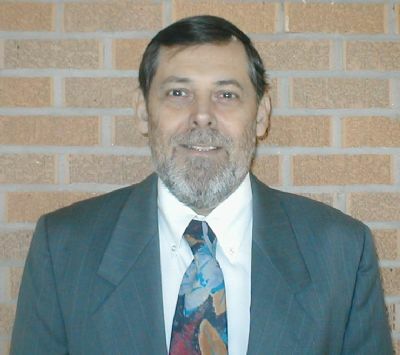 He is currently the outreach and pulpit minister for the North Jefferson church of Christ in Mt. Pleasant. He speaks regularly in gospel meetings, lectureships, and other brotherhood events and has written articles for several publications. Groda appears regularly as a panelist on the “Give Me the Bible” television program. Active in the community, Groda serves as chaplain for the Titus Regional Medical Center and the city police department. He also serves on the board of several community and volunteer agencies. Groda tweets at @KrisGroda. He and his wife, Lena, are raising Joseph, Kelly Brianne, and Kendall. The church meets at 1701 N. Adams St. in the 78102 Zip code. For more information, call the church office at 361-358-4428. 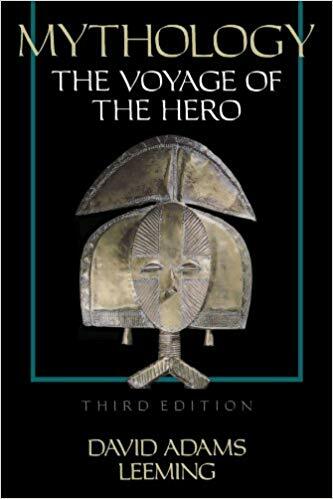 When I taught a World Literature course at San Antonio College before I retired several years ago, I came across a fascinating book by David A. Leeming titled “Mythology: the Voyage of the Hero” (3rd ed., 1998, Oxford U. Press). I realize that conservative Christians usually consider “myth” a “four-letter word.” We have heard too many agnostic/atheistic dismissals of the Bible as collection of myths that have no basis in reality. On the other hand, there exists among even secular, non-believing scholars an interpretation of mythology that doesn’t necessarily reject the validity of religious texts such as the Bible, and Leeming belongs in this group. His thesis is that certain universal experiences are “hard-wired” into the human mind, similar to a common belief among primitive cultures in a creating divinity and a devastating world-wide flood. Leeming classified these commonly shared experiences into eight specific groups and identified them collectively as “the Voyage of the Hero.” The eight groups include the following: “Miraculous Conception, Birth, and Hiding of the Child” (22 examples discussed), “Childhood, Initiation, and Divine Signs” (15), “Preparation, Meditation, Withdrawal, and Refusal” (13), “Trial and Quest” (15), “Death and the Scapegoat” (14), “Descent into the Underworld” (15), “Resurrection and Rebirth” (17), “Ascension, Apotheosis [Deification], and Atonement” (11). The lack of space prevents discussion of these eight categories in any detail, but what stands out is that Jesus appears in every category of experience and is the only individual to do so. He is also one of the few included characters whose historical existence has been well established. 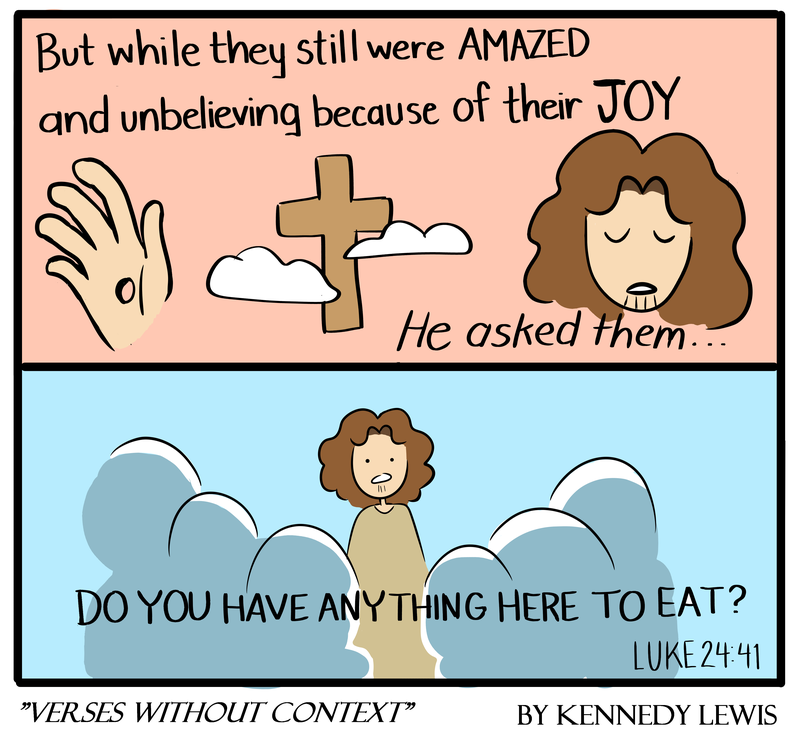 Even skeptics and atheists agree that Jesus actually lived, in contrast to the “mythological” characters. Sampling some of the more important categories will provide an idea of how Leeming developed his thesis. The opening section, “Miraculous Conception, Birth, and Hiding of the Child,” includes the miraculous conception of Jesus revealed in the Gospels, as well as his being hidden away in Egypt to escape the wrath of Herod. The other examples, with the exceptions of Moses and Buddha, whose birth stories are similar, include world-wide mythological characters such as Zeus, Dionysus, and Persephone, who belong to Greek mythology. Jesus, as well as Moses, Buddha, and Mohammad appear as historical figures in the third category, “Preparation, Meditation, Withdrawal, and Refusal,” in addition to mythical heroes such as Odysseus (Ulysses) and Achilles from the epic poems of Homer. The narrative details on Jesus focus on his 40-day withdrawal into the wilderness where he refuses the temptations of Satan. 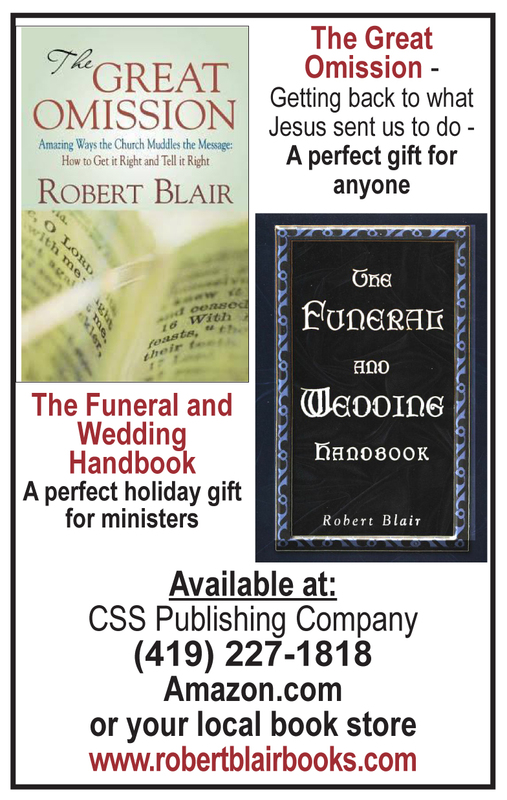 Parts five, six, and seven, which concern sacrificial death, descent into the underworld (or burial), and resurrection or rebirth, have the most relevance from the Christian perspective. Of course, it is easy for Christians to identify these details in the Gospels’ account of Jesus’ cruel death as a sacrificial scapegoat, his three-day burial in the tomb, and his resurrection on the third day. Yet it is also interesting to discover that several mythological “heroes” supposedly experienced one or more of these events. These include among others Hercules and Adonis (Greek), Isis and Osiris (Egypt), Buddha (India), Bear Man and Quetzalcoatl (Native American). Predictably, the last of the eight categories deals with ascension of the hero into “heaven” or acquisition of divine status (“apotheosis”). The fullest examples in the life of Jesus appear in Luke 24 and Acts 1, but Leeman also included Abraham and Moses, along with the mythological Hercules, Quetzalcoatl, and King Arthur. The inclusion of Mary is based more on Catholic tradition than biblical revelation. But what is the significance of all this diverse, theoretical discussion in Leeming’s book of the “hero’s” journey through life and beyond? In my opinion, it validates the conviction that these stages of human experience, which are so clearly laid out in the story of Jesus and other characters, historical and mythological, aren’t coincidental. They reveal the universal longing found deep in the human heart for ultimate meaning in life. For Christians (though not for Leeming) this meaning can be found only in the divinely inspired account of the Messiah, the Lord Jesus Christ. Back in the 1950’s, my family and I were members of the old Herring Avenue Church of Christ in Waco. When I was about 12 years old, the song director decided to put together a children’s choral group of 10-12 members, and we were invited to sing after a Sunday evening service during the Christmas season. One of the songs we were scheduled to sing was “Peace, Perfect Peace,” but I was so frightened of appearing in public that I convinced myself that Sunday afternoon that I was running a fever and wouldn’t be able to perform. Fortunately, my mother rejected this “nonsense” and forced me to participate. As things turned out, the performance went well, and I was pleased—and relieved when it was over—that I had played my part. If I had taken the words of the song a little more seriously, perhaps I wouldn’t have gotten so up-tight about singing before a group. Of course, this principle applies on a much higher level in the adult world. The fact that the Apostles Paul and Peter included the words “grace and peace” in the greeting section of all their epistles was not just a matter of routine. They undoubtedly wanted to emphasize the importance of these two ideas and the connection between them: because of God’s grace, we can experience the “peace of God, which transcends all understanding” (Phil. 4:7 NIV). This emphasis on peace appears in one of Isaiah’s Messianic prophecies when he predicted a child to be born who would be identified as the “Prince of Peace” (9:6). Luke confirmed this prediction in Chapter 2 of his Gospel when the angel announced to the shepherds “Glory to God in the highest heaven, and on earth peace to those on whom his favor rests” (2:14). The importance of peace is further underscored by the fact that Paul included it as the third element in the “fruit of the Spirit” (Gal. 5:22). Unfortunately, there is really not much we can do to promote peace in the world at large except to pray for it, but that may accomplish more than we think, if we offer focused prayers. Instead of asking for “world peace” in general, like the beauty contest contestants of the past, we could appeal for peace in specific locations, such as North Korea, Afghanistan, Iraq, Yemen, and Syria. These prayers could include specific leaders and diplomats, who are working hard to achieve peace in these trouble spots. On the individual spiritual level, the Bible offers abundant advice to help us. While Job questioned why the wicked “go down to the grave in peace” (21:13), one of David’s Psalms affirms that “the meek will inherit the land and enjoy peace and prosperity” (37:11). Just as this Psalm anticipates the third of Jesus’ beatitudes in Matthew 5, “Blessed are the meek” (v.5), so Proverbs 12:20, “Those who promote peace have joy,” anticipates the seventh beatitude, which blesses the peacemakers. Another well-known Proverb states, “Better a dry crust with peace and quiet than a house full of feasting and strife” (17:1). This Proverb’s emphasis on contentment bringing peace reminds us of Paul’s confession to the Philippian Christians that he had “learned to be content whatever the circumstances” (Phil. 4:11). Paul had earlier made clear in his letter to the Ephesians that the ultimate source of spiritual peace is our relationship with Jesus, “For he himself is our peace,” who “came and preached peace to you [Gentiles] who were far away and peace to those who were near [Jews]” (2: 14,17). Thus the attributes of meekness (gentleness), peacemaking, contentment, and a relationship with Jesus are just some of the roads to spiritual peace in our individual lives. As Jesus so aptly expressed it in John 14, “Peace I leave with you, my peace I give you. I do not give as the world gives. Do not let your hearts be troubled and do not be afraid” (14:27). This comforting assurance of “Peace, Perfect Peace” is just as true now as it was back in the first century. 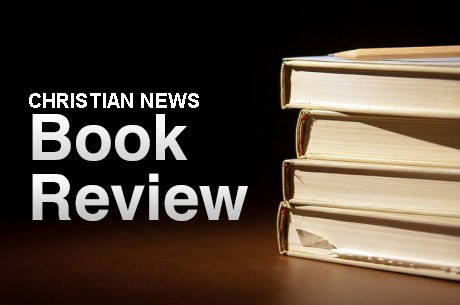 CORPUS CHRISTI – When the church asks, ““Can We Trust the Bible?” Dr. Denny Petrillo’s unequivocal and unapologetic answer is “Yes!” The preacher, author and Christian college teacher spoke to that effect on Feb. 23-24 at the Weber Road church of Christ here. 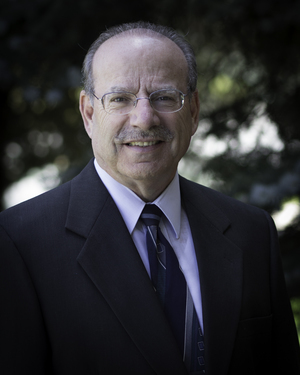 He currently serves as President of the Bear Valley Bible Institute in Denver. 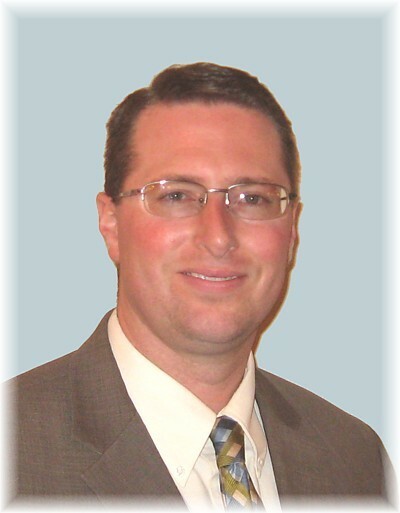 Petrillo is well-versed in the original languages and exegesis, having earned a master’s degree from the Harding Graduate School of Religion and a Ph.D. in Religious Adult Education at the University of Nebraska. Minister Mark Hammitt reports. If you truly believe the Bible is trustworthy, how do you respond? Friends, trusting the Bible is just the first step to obeying the commands that God put in it. If you really trust the Bible, will you determine to be faithful to God and His word, learning to “rightly handle the word of truth?” (2 Tim. 2:15). The death was tragic and sudden and would leave ANYONE asking, “Why, God?” And as all mothers and fathers know, this is something we never, ever want to experience ourselves – it is a parents’ nightmare too terrible to even think about. I know the grandfather was devastated over losing his only grandchild, but, as he put it, he managed to pull himself together to deliver the message: our days are numbered. He said that some people have more days than others. Whatever the number, if the days are spent serving God, it is enough. And at the end, God is there waiting for us. Who else but someone with a deep faith in God can glean such a lesson from such a tragedy? This loving grandfather was leaning on God alone to deliver this touching message; I do not see any other way he could have done this. As we sang, “And today I’ll walk beside Him, for He knows what lies ahead,” I thought, this young woman’s unexpected death is the raw truth of those words – you either have your faith in the One Who holds tomorrow, or you are without hope and God in this world (Eph. 2:12). There is no answer to the question of “why” such things happen that can alleviate the pain. We live in a flawed world. Jesus promised us we would have trials and tribulations. And tragedies. Life is just plain HARD. As the grandfather pointed out, if your numbered days are more, you will face more trials, tribulations, and tragedies. We don’t know what tomorrow holds, but we know Who holds tomorrow. Jesus also told us to “be of good cheer, for I have overcome the world” (John 16:33). There is an eternal life beyond this life, and those of us still left behind can only mourn and weep and miss our loved ones. But a Christian also has faith – faith that when we move on, we will join those who now know what it is to be with God our Father and Jesus our Savior. Memorial services for our loved ones get rid of The Ugly – death and its sting -and fill the space with The Good. We come together as a family and love and hug on one another. We shed tears without embarrassment. We recount memories that make us smile and laugh; we remember examples that inspire, and we share a time of reflection. We remember not the sting of death; instead we remember our loved one’s living soul that is now in the presence of God. This grandfather helped us do just that, and we love him for it and for his reminder of the love of the One Who holds tomorrow. 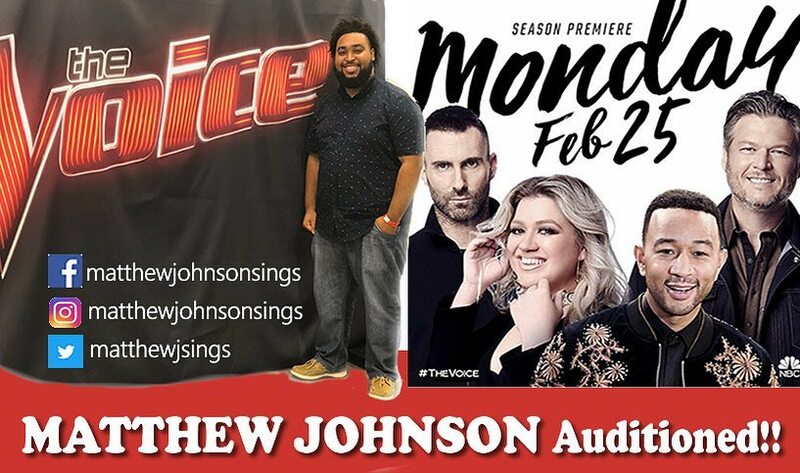 SAN ANTONIO – Forty seconds into his song, Matthew Johnson got all four chairs to turn with his “I Smile” cover on NBC’s The Voice. The show begins with four judges turning their back to the singer. The judges have to push a button, indicating their approval, to turn and see the singer. His piece ended with a standing ovation from the crowd and the judges. The singer is from Jacksonville Florida and attends Northside Church of Christ. Johnson’s voice was clear and relaxed as he sang. The judges had many good things to say as they tried to convince him to choose their team for the rest of the competition. After much thought, he chose Legend’s team as he advanced to the next level. To see Johnson’s performange go to youtube.com/watch?v=nN_maUhEkNU or follow him on social media. Viewers of the show can help their favorite singer win by voting on The Voice App from Google Play or the App Store. The show airs Mondays & Tuesdays at 7 p.m.
Progress is the building up of what exists, not necessarily the show of total replacement with something new. It’s easy to demolish something. It doesn’t take much skill or wisdom to tear down. One doesn’t need to read a blueprint or give much attention to details. All it normally requires is brute force and power. When it comes to the matter of a Christian’s influence on others, the Bible is quite clear that we are not to be in the business of demolition, but edification, building up (Ephesians 4: 29). “But,” one might argue, “Demolition is so easy.” And, it is! All it takes is a few power words like, “failure,” “hopeless,” “ugly,” “bad,” or “worthless.” There doesn’t have to be any affection or carefully measured words of encouragement. It takes only a few blows of the tongue, even in gossip, to become the sledgehammer that shatters a heart. Sometimes the Christian’s influence on others is most effective when one is silent; actions speak louder than words. To illustrate, a big Marine sergeant was once asked the circumstances of his conversion to Christianity. He told about a private in his company who was frequently harassed by other soldiers for his religious faith. One night the private came into the barracks quite late. It was a very rainy night. Before getting into his bunk, he knelt, as was his custom, to pray. Turning the other cheek is not easy (Matt. 5: 38-42). The first inclination is to strike back, to get even, or to seek revenge. The route Jesus urges upon us is the behavior which is more likely to influence the other person for good. May we all give attention to what we say and do! To tear down the spirit and worth of another takes no godliness at all. To batter down those already discouraged by troubles is about the easiest task one will ever find. On the other hand, to be a masterful builder of others, to inspire love and dedication to God in those we meet, is to be like Christ himself. 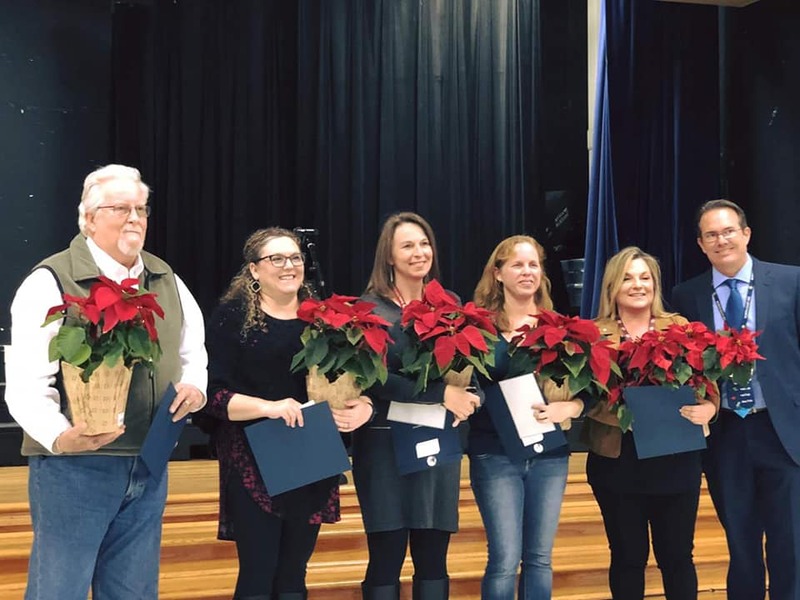 SAN ANTONIO — “This is a time to celebrate and honor the PTA volunteers who have done great work for our students and campuses,” said North East ISD Superintendent, Dr. Brian G. Gottardy. He spoke at the NEISD 2019 Founders Day celebration on Feb. 7 at MacArthur High School. Northside member, teacher and former elder, Maynard Leese, was recognized as a PTA volunteer mentor at Encino Park Elementary School that day. He and others who give of their time and efforts on behalf of children gathered with NEISD administrators and staff for the dinner and award presentations. Founders’ Day marks the anniversary of the formation of National PTA in 1897. It is a reminder of the support that the chapters provide to parents and students at the local, regional and national levels. SAN ANTONIO — John and Davida Hollingsworth are celebrating their 70th wedding anniversary this year. The official anniversary date was January 4, but such an accomplishment deserves extended honor, so they’ve opted to celebrate all year long. Many long-time members of churches of Christ here and beyond have fond memories of the example that this Christian couple set. John spent 67 years in the pulpit as a dedicated preacher of the gospel. He preached at the Jefferson Church of Christ here during the mid-1960’s, with Davida’s devoted support. 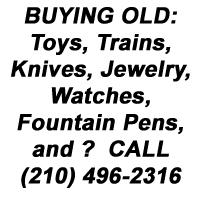 From San Antonio they moved to Los Angeles in the late 1960’s. Davida served as Administrative Assistant to Pepperdine University leaders, including successive Chancellors Norvel Young and Bill Banowski, and also to Dean and President, Howard White. 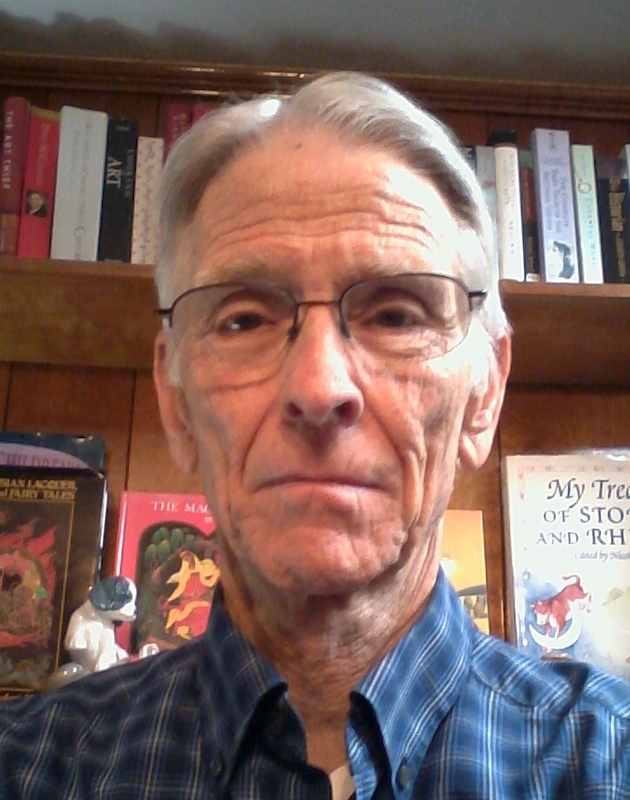 Between 1974 and 1977, John also worked at Pepperdine, serving as Director of Personnel Procedures and Registrar of Students. After a move to Henderson, Tenn., John taught Bible and Interdisciplinary Studies at Freed-Hardeman University for 22 years, retiring as a full professor and Assistant Vice-President of Academic Affairs. John Hollingsworth didn’t rest on his laurels after retirement. 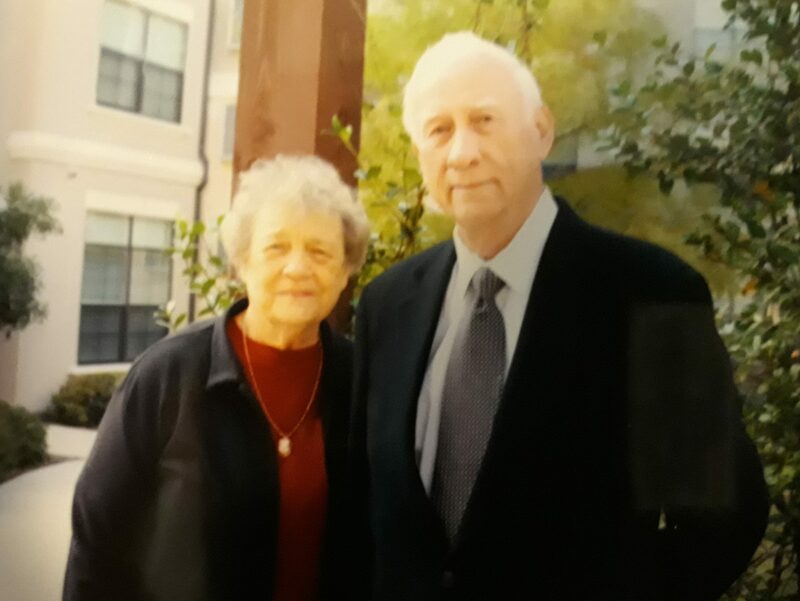 When he and Davida moved into the San Antonio Franklin Park Sonterra senior living community in 2010, John volunteered his services as a ministry chaplain and served in that capacity for seven and one-half years. As a result, from May 25, 2010, to the present, a non-denominational worship has been conducted every Sunday in the chapel. Soon after the chapel was opened, Franklin Park furnished a pulpit, a communion table, and 30 comfortable chairs, as well as hymn books and Bibles. These donated items enabled John and his associates to lead a scripturally-based, non-denominational worship service, including the Lord’s Supper, for participating residents. With the assistance of Franklin Park, appreciative residents even purchased and installed a stained-glass window. More recently, as John’s physical strength declined with advancing age, he was forced to turn his ministerial duties over to younger Church of Christ ministers, who have continued to carry on his legacy of preaching the Gospel of Christ to the Franklin Park residents. John and Davida have moved on to another residence because John’s weakened physical condition has required more intensive care. 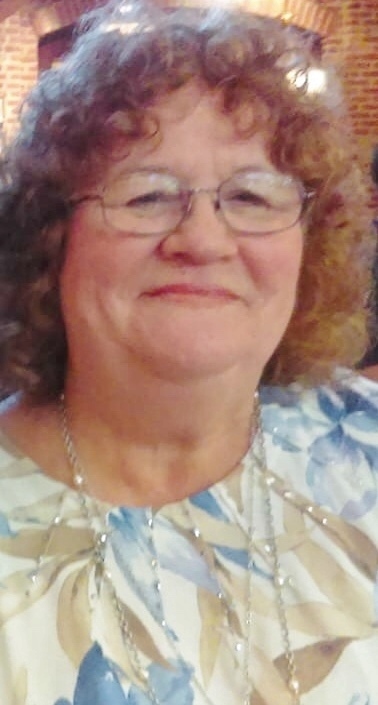 Yet Davida has lovingly continued to provide as much care and nurture on her part as possible. Anyone who pays them a visit these days leaves feeling uplifted and encouraged by the Christian example that this loving couple exhibits. Happy 70th Anniversary, John and Davida! 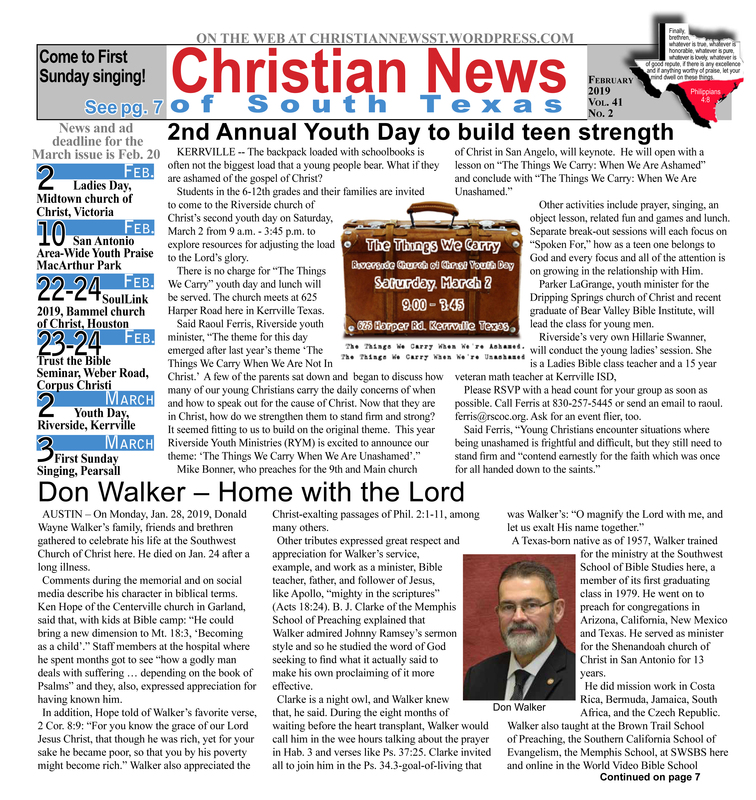 SAN ANTONIO – “We believe that a program that puts our youth in the Bible is indeed a worthwhile effort!” So goes part of the greeting on the Texas Bible Bowl home page. The weekend competition, set for April 5-7 this year, draws up to 120 contestants annually to Camp Bandina from as far away as Plano and League City near Houston, as well as from the San Antonio area. Registration closes on March 18. To sign up, coaches may click on the Registration tab at TexasBibleBowl.org. Study began for many once the practice questions and other materials went online last August. 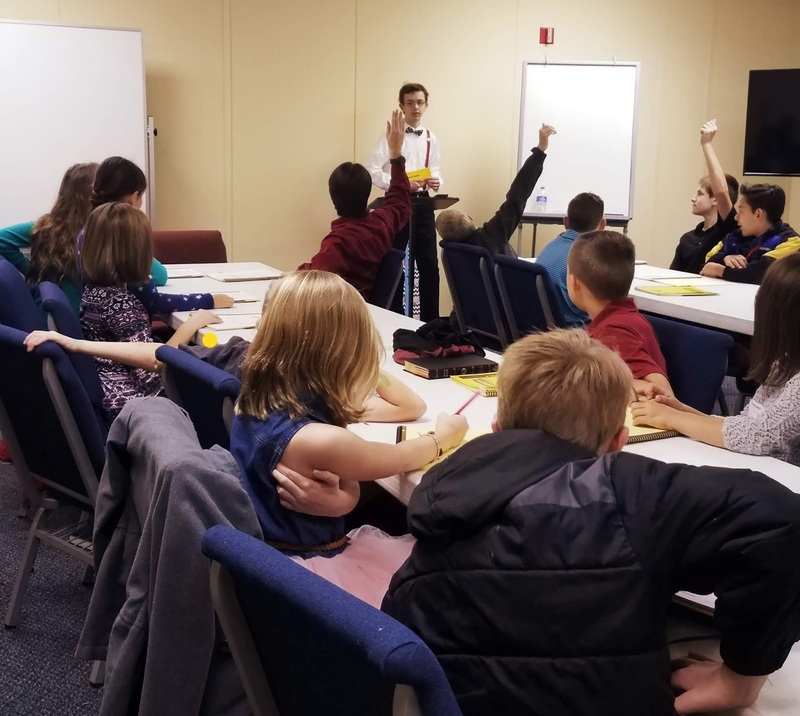 Says Lisa Kirkwood, blogger, TBB board member and coach for the McDermott Road congregation in Plano: “One of the great things about teaching Bible Bowl for so many years is I get to see these young people grow up into adults, into Christians serving the Lord’s body. Today was one of those wonderful moments. “Matthew has been actively involved in my Bible bowl classes since he was in third grade and today, he took on the role as teacher. Matthew taught a class full of his peers over John chapter six. 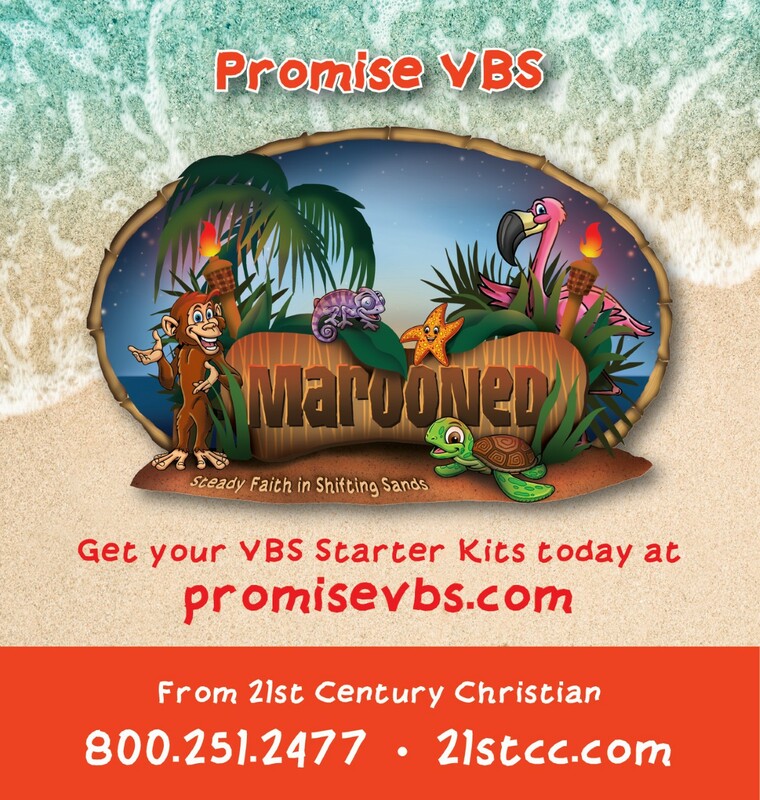 A program that gets young people ready to pass on the Word about Jesus? Totally worth it. More information is online at TexasBibleBowl.org. SAN ANTONIO – “And the Word became flesh and dwelt among us, and we have seen his glory, glory as of the only Son from the Father, full of grace and truth (John 1:14). Area teachers will draw on the remarkable truths embedded in this verse and many others from the first part of John’s gospel during Northern Oaks church of Christ’s Enhanced Bible Studies this spring. The EBS study is a deep dive into learning. During most weeks, one chapter from John 1-10 takes up the first hour. The closing session covers an aspect of “God’s Design for the Home.” See Northern Oaks’ contact information in this issue’s church directory for the location. Abraham Rios’ lesson on chapter 1, “The Word Became Flesh,” and Obed Pineda’s “Dating, Courtship and Marriage” kicked off the term on March 7. These are the remaining dates, speakers, and lesson titles. 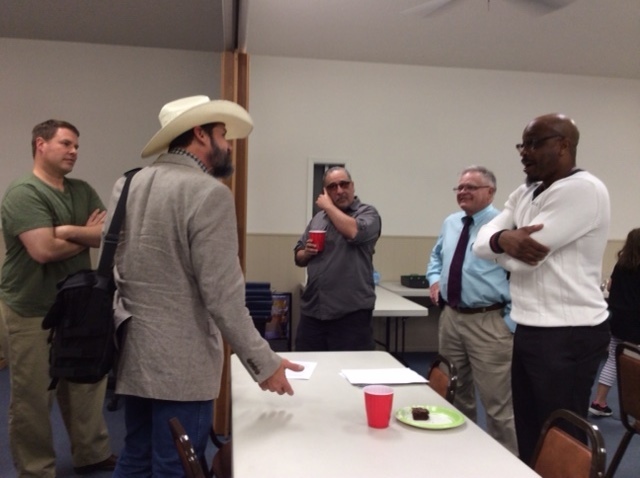 From left, Mel Hutzler, Jim Word, Abraham Rios, Daryl Shewmaker, and Shawn Price connect at EBS. Moon shows God’s intricate plan for our world last two months. The night sky has been showing off the creativity of God over the last two months. January’s full moon was a combination Full Wolf Moon and a Total Lunar Eclipse. The full moon of January, called the Wolf Moon, occurred just after midnight on January 21. The full moon of February was Tuesday, Feb. 19, at 10:53 a.m. EST but appeared full the night before. It was also a “supermoon” according to NASA. The February full moon is often known as the Full Snow Moon. 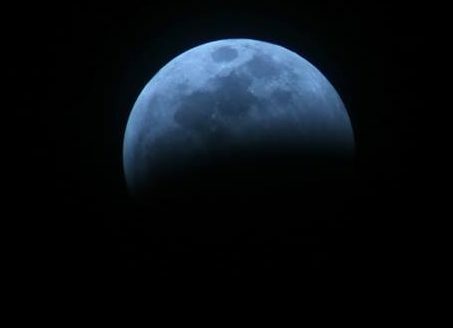 A photo of the January moon as it begins to eclipse. 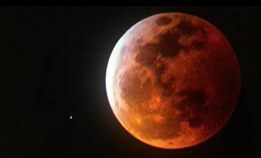 A photo of the blood moon at full eclipse.